Is Shimla Living on the Edge? The recent NGT ban on construction in the core area of Shimla and restricting the number of floors to two in the non-core area is a welcome step, but it was too late in coming as the damage has already been done to this beautiful capital of Himachal Pradesh. Shimla looks resplendent and shimmering at night but as the day unfolds the ugly under belly of the town is exposed. The core area where construction has been banned is already chock a block with buildings having access through narrow lanes and dingy stairways sandwiched in between, with no open spaces, let alone parks & green areas. The only breather for Shimlaites is the main Mall and the Ridge which offers a sauntering area sans traffic stretching onto Vidhan Sabha on one side & the CM’s residence (Oakover) on the other. The Jakhu hill, overlooking the main Mall & the Ridge, is a concrete mess with a few six storey structures soaring over other buildings & making a mockery of the building bye-laws in this high seismic prone town (zone 4). Since most of the buildings are not complying with the structure stability norms, an earthquake of moderate intensity measuring 5 or more on the Richter scale could have a cascading effect on the buildings built on the slopes, which will inevitably lead to widespread devastation. The circular road is the lifeline of Shimla and encircles the core area of the town providing connectivity to all schools & the main hospital of the town & the State (IGMC). Even in an earthquake of moderate intensity, this circular road is bound to sustain damage and blockage because of debris falling on this road from the upper slopes and also the caving in of retaining walls which support this road from below at many points. The disruption of this lifeline- which is inevitable in case of a moderate tremor- will put paid to all evacuation and rescue measures leaving men, women & children stranded and helpless without any medical aid or help. Dr Anand S Arya (Dept of Earthquake Engineering, Univ. of Roorkee) has worked out an average return period of earthquakes for various parts of the country, and for Himachal for earthquakes of magnitude > 5, the recurring period is between 2.5 & 3 years. In a hypothetical study conducted by Dr. Arya on the recurrence of earthquakes in the Kangra region of Himachal and its probable effect on buildings which are earthquake resistant and those without earthquake safety norms, the results show that the loss of human lives will be cut by 1/5th and the totally devastated buildings will be reduced by 1/4th if the buildings are earthquake compliant. The earthquake in Kangra in 1905 which measured 7.8 on the Richter scale resulted in the death of over 19000 people apart from loss to property. In Shimla, with most of the buildings not adhering to the safety norms apart from being built on steep slopes & gradients, the consequences of an earthquake would be catastrophic on this tourist town. The stackpiling of buildings one on top of the other on hill slopes is a common sight in Shimla, and when a majority if not all of these buildings are not built as per earthquake safety norms it is double trouble for the residents. With governments​ legalizing unplanned, haphazard & unauthorised constructions by bringing out retention policies – like the present Congress government did towards the fag end of its term – to favour a few, the safety norms are pushed to the backburner. 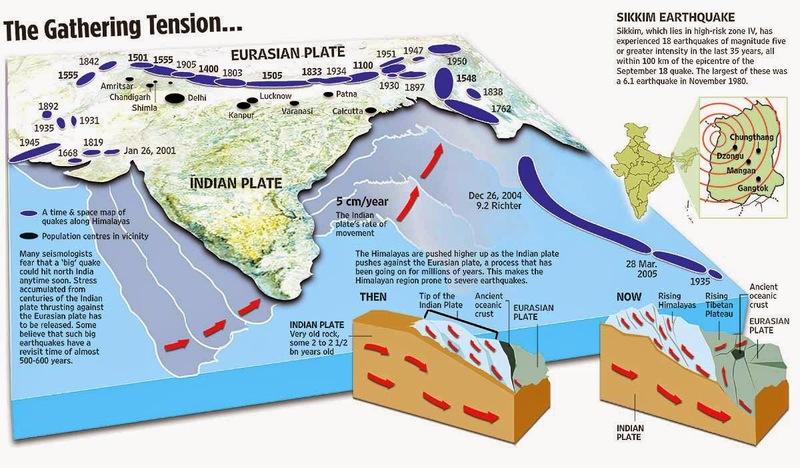 The Municipal Corporation & the Town Planning have allowed unauthorised & multi-storey constructions, and are perhaps oblivious to fact that the continuous threshing of the Indian plate with the Eurasian plate is slowly pushing Shimla to the high risk zone 5 like Kangra & Chamba regions of Himachal. The NGT’s construction ban in the core area should be a wake up call for future governments to put some disaster plan in place, and if the government already has a disaster plan then it should be shared with the public who will bear the brunt if a major tremor were to occur. To minimise the damage in an earthquake situation, the government instead of bringing out retention policies should bring out a policy where by all buildings which are not earthquake compliant are retrofitted to make them survive an earthquake and thus minimise the damage to life and property. The extra cost of earthquake safety provisions for all houses would be miniscule as compared to the devastation that might occur if they are not equipped with safety measures. Dr A S Arya’s hypothetical study conducted for the Kangra region lends credence to this approach. According to Dr. Arya, if all 18,15,858 buildings are without earthquake safety provisions the direct losses will mount to Rs. 51.04 billion as compared to Rs. 19.6 billion if all buildings were made earthquake resistant as per IS: 4326 & IS: 13928 norms. His study says that the extra cost of earthquake safety provisions would be only Rs. 6.35 billion. However, for Shimla with a population of over 2. 5 lakhs & and the number of buildings only in thousands, the cost of retrofitting will be miniscule as compared to the above figures. But with the State already reeling under a 50,000 crore debt and with 60% of the debt to be repayed in the next seven years coupled with the government’s​ revenue being eaten up by interest repayment, that looks like a tall order. For the moment, the residents of this hill town continue to live on the edge.